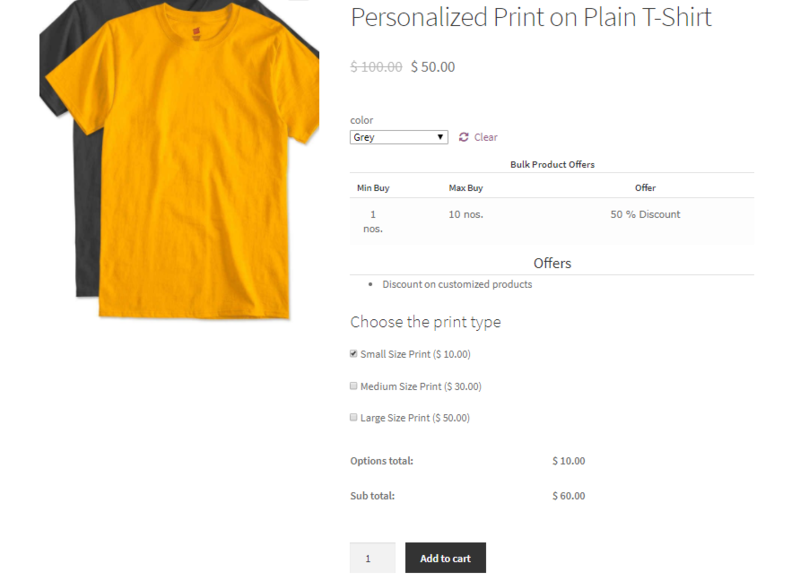 This article aims to give a simple guide to creating a store for selling customized products using WooCommerce Product Add-ons and or Dynamic Pricing and Discounts plugin. Customized products have gained huge popularity in today’s world. With customers being ready to pay a little extra, product personalization industry has its demand soaring every single day. This gave rise to stores like Vistaprint etc. Going by the current trend, it doesn’t look like the demand for customized products in going down anytime soon. Product customization is not any longer limited to mugs, t-shirts, pens it has reached to the likes of cars, bikes etc. What does the WooCommerce Product Add-Ons plugin do? It’s a premium plugin which can add any number of customization options to either all or particular products. You store might sell both customizable as well as non-customizable products. That’s why this plugin has got the settings to add options at product level. This plugin also enables you to add corresponding prices to each option. 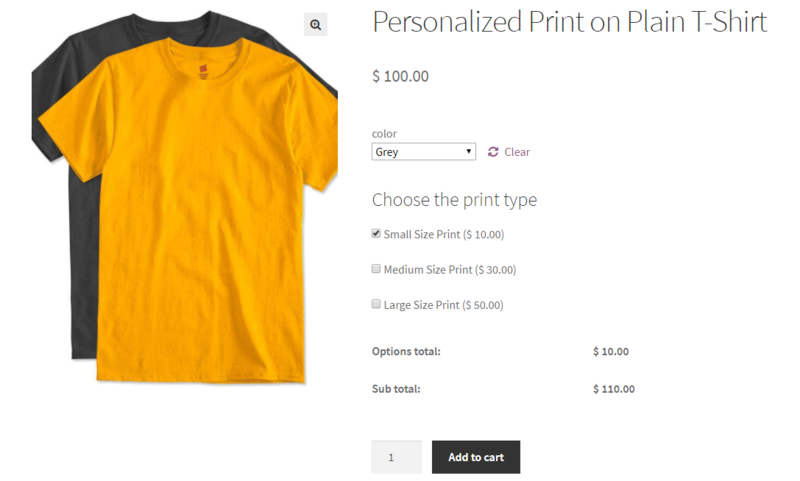 In the frontend, the customer gets to select any number of customization options. After installing and activating the plugin, I have setup some addon options for a variable product. 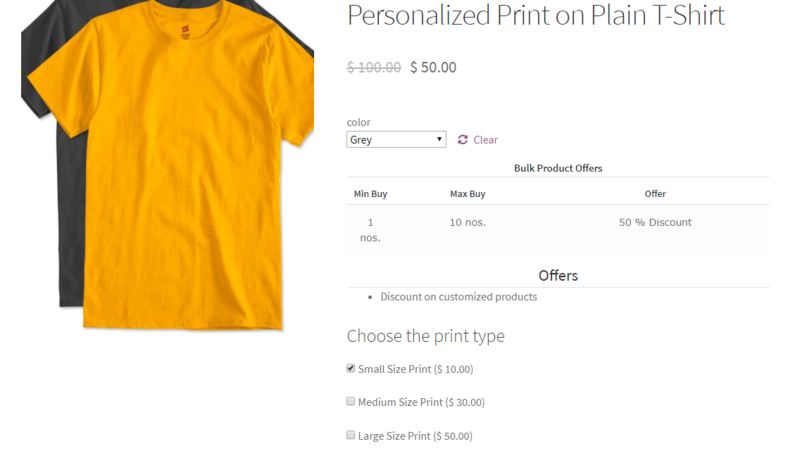 After that, I have configured different cost based on the print size. What does WordPress File Uploader do? 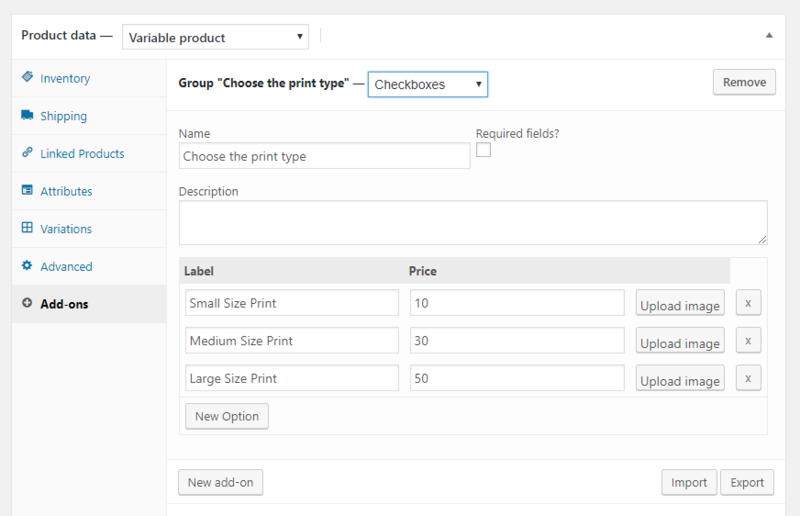 With WooCommerce Product Add-Ons, you can allow your customers to select customization options. But, it doesn’t have any way of getting the exact input from the customer. The customer might want to add images/text to be printed on the t-shirt, mugs etc. That’s where WordPress File Uploader plugin comes into play. With this plugin installed, you can allow your customers to upload images at either product level or cart page or even at checkout page. Thus, this plugin completes the entire process of customization. 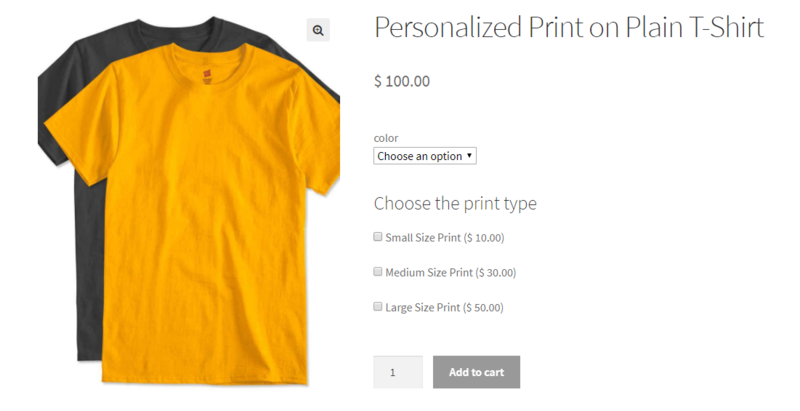 Now, let’s give the customers an option to upload their preferred image to be printed on the t-shirt. After installing and activating the WordPress File Uploader plugin, place the shortcode [wordpress_file_upload] at any preferred location where you would like your users to upload the file. I have placed the shortcode in the ‘Description’ of the product. Once a customer places an order with an uploaded image, you would get every information in the ‘View Log’ section of the ‘WordPress File Uploader Control Panel’. This would let the shop owner know which image corresponds to which order. What’s the role of a Dynamic Pricing and Discounts plugin? With the help of the Dynamic Pricing and Discounts plugin you can choose to add discount either only on the product price or on the total price the addon price has been added. 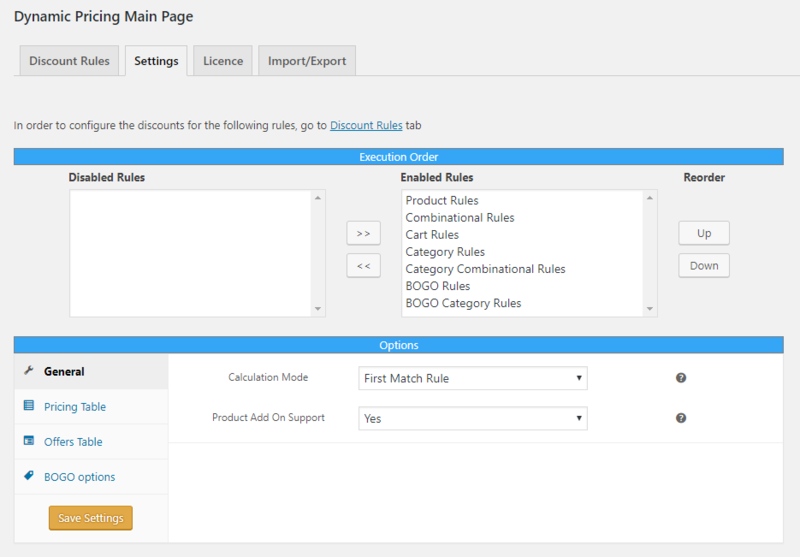 When the WooCommerce Product Add-ons plugin is active, an extra field appears in the settings page of the dynamic pricing and discounts plugin. That extra field is ‘Product Add On Support’. 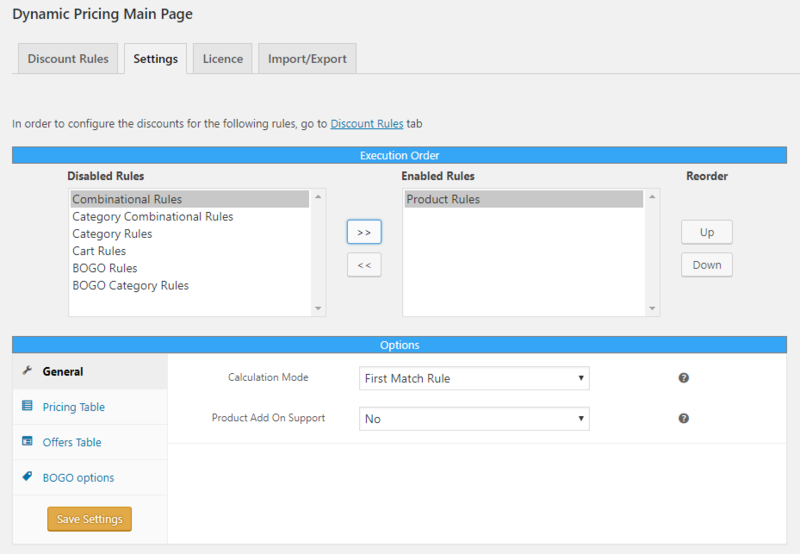 With this option, the discount rule gets applied to only initial price of the product and the addon price is added as it is. In the above image, the discount of 50% gets applied to the initial regular price of the product. That’s why $100 gets converted to $50. But, the addon price of $10 gets added as it is. In the next case, let’s configure ‘Yes’ for ‘Product Add On Support’. The beauty of a WooCommerce plugin is that, they provide a lot of scopes to the developers for further enhancements, buy exposing hooks. Adding images corresponding to the addon option is a desirable feature. Wouldn’t it be nice if you get to upload a different image for every option? Something like the image below which would give your store an enhanced professional look. This article on ‘How to add images to your WooCommerce product addons’ helps you achieve exactly that. The above-mentioned article would even give you some more customization tips like hiding of some fields dynamically etc. That’s it! Feel free to share your thoughts on this article in the comment section.